As per the Indian tradition, the Ashwin Vadya Trayodashi (as per the Hindu Calendar month) is known as Dhanatrayodashi. On this day, an elaborate poojan (worship) of sources that generate energy such as, money, ornaments and lights as per tradition. The underlying sentiment of the fundamental prayer behind the ritual is, ‘Oh mother Laxmi, we will respect the wealth that You endow us with and will expend it for performing good deeds that You like. May the wealth continue to multiply through pious means’. One may secure blessings of both Adimata Mahalaxmi and Bhaktamata Shree Laxmi on the auspicious day of Dhanatrayodashi. The ‘Shree Yantra’ is the basis of the two mother Goddesses. One can easily secure the grace of Adimata Mahalaxmi and Bhaktamata Shree Laxmi by the mere worship and darshan of the Shree Yantra. Sadguru Shree Aniruddha has described the Shree Yantra as follows, The Shree Yantra is a fortress, which is the abode of Adimata. The mere darshan of the Shree Yantra with faith provides strength to the centres of the human body. The word ‘Shree’ means being supreme. It means being venerable as also being the medium for receiving the Shadosha Aishwarya (16 types of wealth and prosperity). The entire power, strength, prosperity and wealth of the universe is subject to Shree. Therefore, the worship and Upasana of the Shree Yantra is an extremely fruitful route for a human being to secure love, the 16 types of wealth attributed to her and strength from the Maha Tripura Sundari (the great, beautiful one Who commands the three worlds) Adimata Chandika. On Dhanatrayodashi, Shraddhavans celebrate the Dhanalaxmi and Shree Yantra Poojan festival at Shree Harigurugram with great devotion under the guidance of Sadguru Shree Aniruddha to acquire all kinds of worldly and spiritual prosperity. Sadguru Shree Aniruddha has elucidated the importance of the Shree Yantra as also its formation and its worship in Matruvatsalyavindanam as well as in his editorials, under the column of Tulsipatra in Dainik Pratyaksha (a daily). On the festive day of Dhanalaxmi Poojan, the establishment and worship of both variations of the Shree Yantra, the two dimensional (top view photo) and the three dimensional (photograph), which has been made Siddha (efficacious) with the jap and 16 types of Upasana, is carried out on the stage as per the guidance of Sadguru Shree Aniruddha. All the Shraddhavans can avail the opportunity to take darshan of the two Shree Yantra(s). The weapons wielded by Adimata and Sadguru Trivikram strike the ill fate (dushprarabdha), the six vices which are the foes of the mankind (shadaripu) and evil tendencies (ku-vrutti) of the Shraddhavans, who remember Adimata and Sadguru Trivikram with utmost humility while regularly revering the Shree Yantra. This active intervention aids the expulsion of obstacles and adversities, which arise in the lives of Shraddhavans due to ill fate, and in their all-round progress. Even the Shraddhavans who do not own a Shree Yantra can attain peace, contentment, solace and the merit of bhakti(devotion), by the mere darshan of the Shree Yantra poojan performed on the stage. 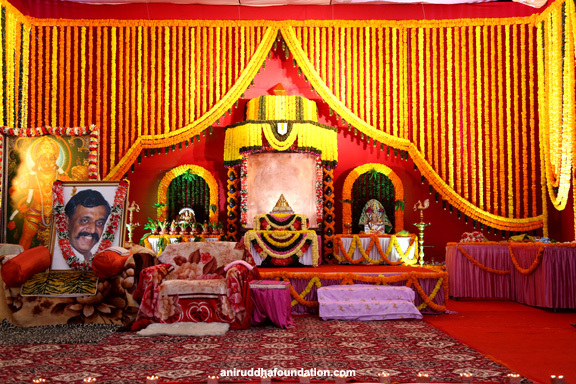 Either Shraddhavans bring along a new replica or their home replica of the Shree Yantra at the venue and may perform its poojan and abhishek (anointment with water) here. 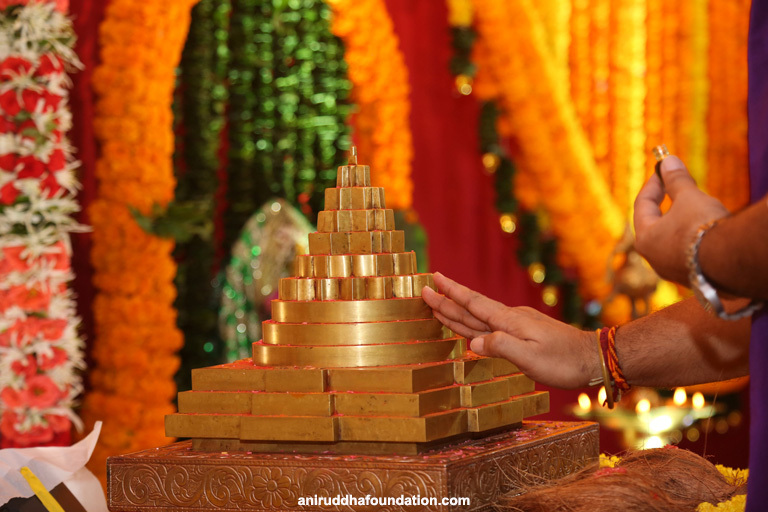 After Sadguru Shree Aniruddha has made the Shree Yantra siddha at the Utsav, the Shraddhavans who so desire may place the Shree Yantra in their place of worship at home or in a locker. The very presence of the Shree Yantra at our home can prove to be beneficial for us. Even if the person performing pooja inadvertently commits a mistake during the Nitya pooja (daily worship) of the Shree Yantra, it does not do any harm rather always proves to be beneficial to them. Therefore, the mere presence of the Shree Yantra is considered to bestow auspiciousness, prosperity, strength and fruitfulness. The one who obtains the darshan of the Shree Yantra with faith receives positive vibrations and all that is apt for that person. 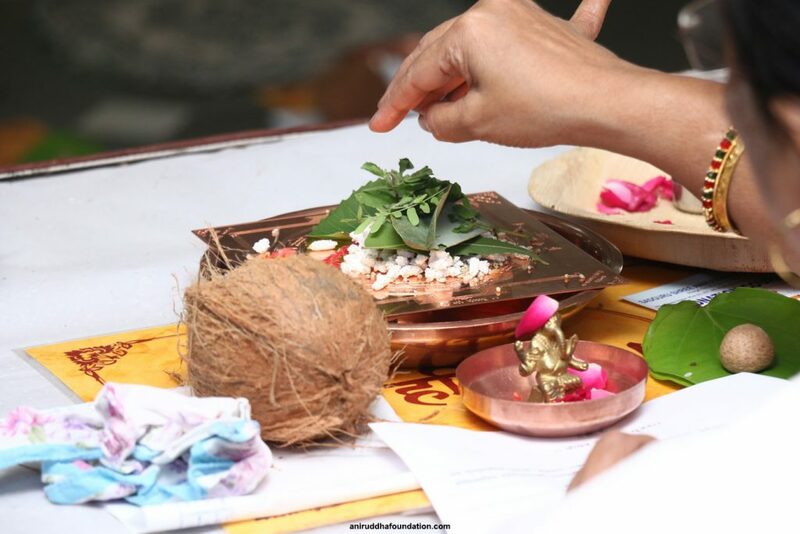 After the Shree Yantra and Shree, Dhanalaxmi poojan is complete, Shraddhavans ceaselessly carry out the recitation of Dattamala Mantra at which time, a holy yadnya (sacred fire) commences. Shraddhavans voluntarily offer samidha (holy tree twigs) in the yadnya. The yadnya and Dattamala Mantra is carried out to secure the grace of Shree by the blessings of Shreeguru Dattatreya. Here Shraddhavans experience an extremely holy atmosphere filled with happiness. The utsav concludes at night after the poornahuti (the complete conclusive offering) is made as also the enthusiastic acclamation of Maha Aarti, gajar and Satsang is presented. Diwali Faral (sweetmeats) collection and its distribution – Shraddhavans, who wish to contribute the sweetmeats to this initiative, bring it along with them at the venue and submit the same. The sweetmeats so collected are then distributed among the poor and needy, as well as to institutions, which provide support and care to orphans, physically challenged and the old. Thus, Shree Dhanalaxmi and Shree Yantra poojan ceremony is celebrated every year in a very devout atmosphere and with great enthusiasm on the day of Dhanatrayodashi from 9 am to 10 pm.